t is online and it’s all about deliberate contention, debate and discussion. Interestingly, the professional conference attenders (mostly from educational institutions) resent the fiddling about with their cosy, old model. I love the way the audiences split down the middle on the speakers. The traditional educationalists hated Malcolm Maclaren and Zena Atkins because they don’t fit into their mouldy mould. On the other hand, the creative types loved these two. The point is to have a mix of the academic, practitioners, evangelists and simply ‘out there’ types. That’s Graham’s forte. Articulate as ever, Maclaren bemoans a system that ignores creativity. A very personal talk about how he made his way in the world. He decried contemporary ‘karaoke culture’ but I’m not sure that this is anything oter than an old svengali looking fondly back over his own shoulder. Zena’s the Chair of OFSTED, and has some pretty strong views on how institutions are warping education. Her message – it’s all about ‘learning’. She castigates teachers for being to wedded to their unions and organisations and not ‘learning’. She’s a big fan of parental choice, a voucher system, and of parental involvement in education, something that most educational professionals abhor. Q1 To what problem is ‘inclusion’ an answer? Doesn’t everyone have a mobile? Q2 Is ‘Digital Divide’ an outmoded term? It’s no longer a poor/rich divide, but a series of fractures. Q3 Does inclusion actually result in exclusion? The fact that the few don’t have the technology means the many don’t get anything. Q4 Has the ‘Digital Britain’ report helped or hindered our digital future? It’s largely about TV, Radio and Newspapers or punishing filesharers. Q5 Is Martha Lane Fox a stupid choice for Inclusion Tzar? Everyone should have a pony? It went OK, but I’ll leave others to judge. If Graham has a problem, it’s with the audience. If the audience gets pared down to educational people it becomes a bit of a teacher-fest, whereas loads of interesting things are happening in corporates, the military and so on. That's not to decry the educational world, simply point out that it's not the whole world. Unfortunately, only those in education and research have the time and money to do this sort of leading edge conference going these days. To be fair he had Bob Harrison on pedagogy some military stuff from Epic on the Nintendo and iPod apps. 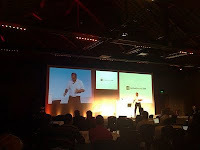 It would be great to see Graham handling a bigger e-learning conference, as opposed to just the ‘Handheld’ stuff. Anything’s got to better than WOLCE! How can we get to hear about the next one? I would have loved to have been there. Sounds like an interesting conference - and format. Lovely to get an ipod instead of brochures and bags. Having worked in both education and corporate, I'm interested in the crossovers. Francis - that's the one. I like Online Educa (Berlin 2-4 December) - great mix of educators, corporates, military and government. I agree Donald, I would've liked to hear a corporate view on things. But well done to Graham for a job well done, I must say. It's to be expected that the educational sector represented the majority of the participants, I suppose. Still, bit surprised there weren't more speakers talking about methodology regarding adult students, as in life long learning. Frank - I agree but learning debate tends to get squeezed into 'schooling' despite the obvious fact that most learning doesn't take plece in educational institutions at all - it's mostly informal. Kids only spend 15% of their time at school. Representing an institution that provides professional education to adult learners - found the focus on schools unremitting and unenlightening. Would have much preferred more cutting edge and thought provoking examples of use of technology in corporate or larger scale training, like the sort of projects that Epic would develop. Interesting - I sometimes feel that the Twittering during presentations is just narcissism and one wonders if they're reflecting and thinking about the issues. CRB checks – overkill or overdue?